Cambodia now has one domestic train service, see the info here, and there are bus links to neighbouring countries. As always, overland travel will be far more interesting than flying, as well as better for the environment, and the journeys will be as much part of your travel experience as the destination cities and sights. This page will help you plan and make overland journeys by bus and train to, from and within Cambodia. Phnom Penh - Battambang - Sisophon - Poipet by train New! Useful country information - currency, visas, etc. Chemin de fer du Cambodge (CFC), http://royal-railway.com. Visas are required by UK, EU, US, Australian and most other western nationals. Visas can be bought at the border points at Poiphet and Bavet, cost about $30. However, it can save hassle at the frontier if you buy an e-visa in advance online at www.evisa.gov.kh for $30 + $7 fee. Cambodian embassy, London. Until 2009 just one train service remained in Cambodia, from Battambang to Phnom Penh. It ran every second day until 2006 when it was cut back to once a week, and in 2009 it stopped running altogether. From 2009 until 2016 there were no regular passenger trains in Cambodia, only buses. However, Cambodian & foreign backers have worked to bring Cambodia's railways back from the dead. 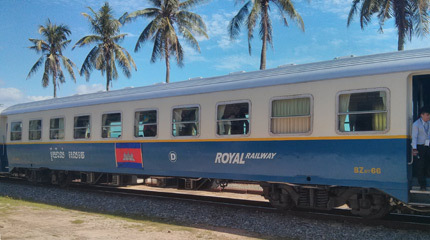 A company called Toll Royal Railway was originally given a 30 year concession to repair and operate the railway, and in 2013 it was planned to reopen both the Southern Line from Phnom Penh to Kampot & Sihanoukville (254 km) and the Northern Line from Phnom Penh to Battambang, Sisophon & Poiphet on the Thai border (388 km). Indeed, I witnessed the new ballast and sleepers being laid between Sisophon and Poipet in late 2011. Problems arose, Toll pulled (or was pushed) out, and a new concession was let. 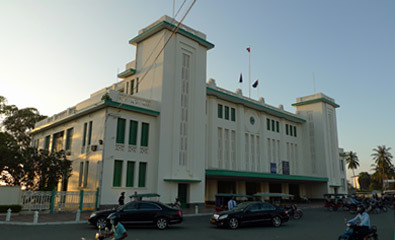 The rehabilitation of Phnom Penh's historic main station has already taken place. See the official site, http://royal-railway.com. Train service on the western line resumed between Phnom Penh, Pursat, Battambang, Sisophon and Poipet on the Thai border in July 2018. It runs every other day. You can check this information at royal-railway.com. Feedback & any photos would be appreciated! In January 2019 it will run on Wednesdays from Phnom Pen to Poipet, Thursdays Poipet to Phnom Penh. From February it will resume running several times per week. Or maybe once a week, they can't make up their minds. Check info at royal-railway.com or www.facebook.com/TRRCambodia. Feedback appreciated. The train consists of 2 cars hauled by a locomotive with car & motorcycle carriers attached. 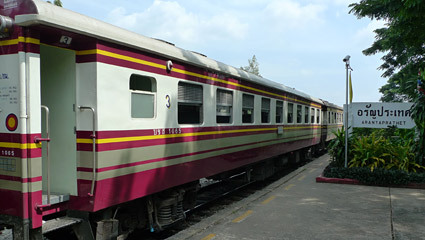 Likely to be similar to the Sihanoukville trains shown below. Buy at the station or by phone on +855 78 888 582-83. 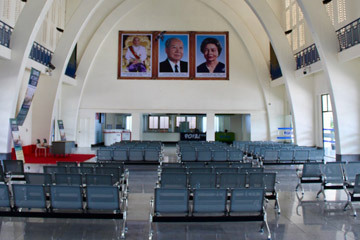 In Phnom Penh, the station ticket office is open 08:00-16:30 weekdays, 06:00-16:00 weekends. Phnom Penh railway station, freshly repainted. It now has passenger trains again! A successful trial passenger service ran during a holiday week between Phnom Penh & Sihanoukville from 9 to 17 April 2016, and a permanent service on this route now runs four times per week as shown below. Please double-check times locally. For more info see http://royal-railway.com/?page=detail&article=82&lg=en. Their site appears to have a booking facility, but reports suggest this may not result in tickets, it's better to use www.baolau.com which is reliable. Sometimes the trains consists of 1 or 2 air-conditioned cars hauled by a locomotive with car & motorcycle carriers attached, car transport $10. Other departures consist of a single-car diesel railcar newly built in Mexico. There seems to be little consistency now. You can buy tickets online from reliable ticketing agency www.baolau.com. Or buy at the station or by phone on +855 78 888 582-83. In Kampot, the station ticket office is open 08:00-16:00 Wed, Thur, Fri, Sat, Sun, Mon. Closed Tuesdays. In Sihanoukville, the station ticket office is open 06:00-16:00 Sat & Sun, 08:00-16:30 Mon, Wed, Thurs, Fri, closed Tuesdays. Do tickets sell out? Yes! Tickets only go on sale at the ticket office one week before departure, all tickets include a numbered seat so places often sell out by the time departure day arrives. In this honeymoon period with the train recently reinstated, it's reported that all seats are sold out by the Wednesday or Thursday for the following Saturday & Sunday. The train also carries cars! Courtesy of Lynne Quayle. 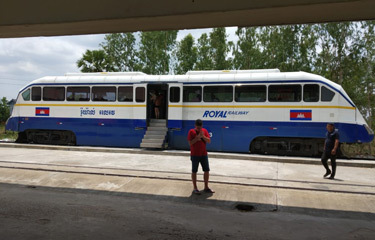 The Phnom Penh - Sihanoukville train using slightly different rolling stock at Takeo station. These cars had air-con, flush toilets and power sockets. Courtesy of Brian Crowley. Sometimes the train is now composed of one of these new single-unit railcars built in Mexico in 2017. Inside one of the single-car trains built in Mexico. These two photos are courtesy of Jay. Traveller Graham Roberts used the new train in 2016: "We took the train from Kampot to Phnom Penh. The ticket does specify a seat number but when we got on the train, the conductor said those seat numbers did not exist and in any case everyone was just sitting wherever. The conductor spoke very good English. The two carriages were about 40% occupied. They showed silent Charlie Chaplin films on two flat-screen TVs in each carriage (this was the air-con train). The train rattles along nicely and rarely stops. We enjoyed the trip greatly, the views are so nice compared to the roadside scenery. The seats were quite comfortable, nicely padded. The rolling stock was French. Good food was available at each station where everyone seems to get out and stretch their legs. One problem with the new service has been a fair few collisions with road traffic. Cambodian rules of the road permit anyone driving a large truck or expensive SUV to consider themselves deserving of priority over other traffic. It's taking them a while to understand this does not work with trains that cannot stop easily! So far, however, no rail passengers or staff have been injured. The main source of casualties on the new line seems to involve people who get drunk and consider the line to be a good place to take a nap." It's easy to travel between Bangkok in Thailand and Saigon (Ho Chi Minh City) in Vietnam overland across Cambodia. It's cheap, and there's a lot to see on the way. There are several ways to break up the journey, so here is a summary of the options. Most travellers will want to go via Siem Reap to see the world-famous temples at Angkor nearby, and Phnom Penh is undoubtedly worth a stop as well. 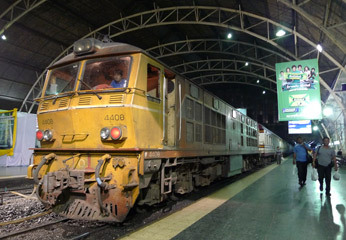 Option 1: The fastest journey from Bangkok to Saigon taking 2 days, 1 night. 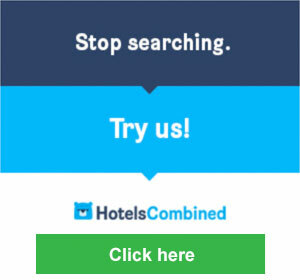 Cost around $40 excluding hotels. Day 1, travel from Bangkok to Siem Reap using the morning train to Aranyaprathet and onward road transport, see here for details. Day 2, take a morning bus from Siem Reap to Saigon, arriving in the early evening, see here for details. However, doing this route in just 2 days won't give you any time to see the Angkor temples, so I'd suggest extending the journey to 3 days to give 2 nights and one full day in Siem Reap to visit Angkor. Option 2: A less hectic option taking 3 days, 2 nights. I highly recommend the speedboat ride! Cost around $65 excluding hotels. Day 1, travel from Bangkok to Siem Reap using the morning train to Aranyaprathet & onward road transport, see here for details. Spend the afternoon in Siem Reap and stop overnight. There's time for a quick tour of the Angkor temples, but I'd recommend stretching the trip to 4 days and spending 2 nights and one full day in Siem Reap. Day 2, take a bus (6.5 hours, details here) or better, the river speedboat (6.5 hours, details here) from Siem Reap to Phnom Penh. 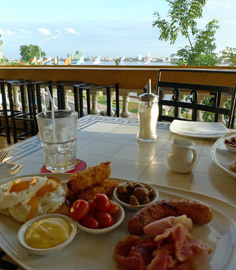 Afternoon & overnight stay in Phnom Penh - I recommend staying at the Foreign Correspondents Club. Day 3, take a bus from Phnom Penh to Saigon, see here for details. Option 1: The fastest journey from Saigon to Bangkok taking 2 days, 1 night. Cost around $40 excluding hotels. 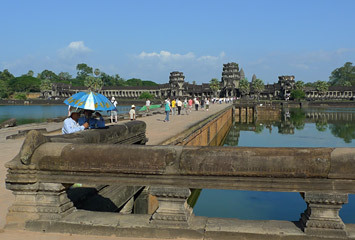 Day 1, travel from Saigon to Siem Reap on a direct morning bus, see here for details. Stay the night in Siem Reap. Day 2, take road transport to the border at Poipet and the afternoon train from Aranyaprathet to Bangkok, details here. This won't give you any time to see the Angkor temples, so I'd suggest extending the journey to 3 days to give 2 nights and one full day in Siem Reap to visit Angkor. Option 2: Here is a less hectic option, taking 3 days, 2 nights. I highly recommend the speedboat ride! Cost around $65 excluding hotels. 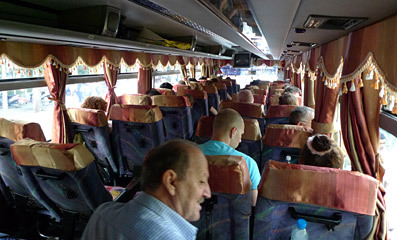 Day 1, travel from Saigon to Phnom Penh on a direct morning bus (6.5 hours), see here for details. Afternoon and overnight stop in Phnom Penh - I recommend staying at the Foreign Correspondents Club. Day 2, take a bus (5 hours, details here) or ideally the river speedboat (6.5 hours, details here) from Phnom Penh to Siem Reap. Day 3, in the morning take bus or taxi to the border at Poipet & take the afternoon train from Aranyaprathet to Bangkok, details here. Bangkok - Siem Reap & PP. 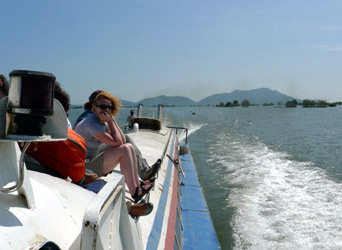 Once in Siem Reap there are buses or an exhilarating speedboat to Phnom Penh. Bangkok to Phnom Penh from $26 (bus) or $48 (speedboat). Although there are direct buses from Bangkok to both Siem Reap and Phnom Penh, this train-bus-speedboat combo is a much nicer way to go than spending whole days in a cramped bus seat. There used to be a railway between Bangkok and Phnom Penh, but since the war in Cambodia it's only been running between Bangkok and Aranyaprathet on the Thai side of the Cambodian border, although until 2009 a train service of sorts also ran between Battambang and Phnom Penh within Cambodia. Update: Work to restore the complete Phnom Penh-Bangkok rail link is almost complete in 2018 and a Bangkok-Phnom Penh train service may start in late 2018. 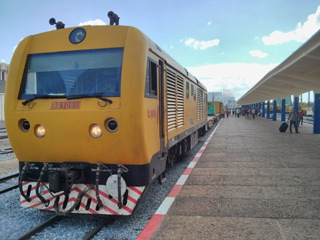 Train service resumed in July 2018 between Phnom Penh and Poipet on the Thai border, see the train travel section above. You can now take the train for this section, but an overnight stop in Poipet is necessary. Step 1, travel from Bangkok to Aranyaprathet by train, leaving Bangkok Hualamphong at 05:55 daily & arriving Aranyaprathet 11:35. The fare is just 48 baht (about £1 or $1.60), no reservation necessary, simply turn up and buy a ticket at the station on the day - yes, the ticket office will be open, no, it can't sell out! They may offer you a combined train+bus ticket to Siem Reap, but just buy the train ticket to stay flexible with onward transport. Bangkok to Aranyaprathet is 255 km, 159 miles. The train is 3rd class only, but it's clean, spacious and it's a really pleasant and enjoyable ride, clickety clacking along with a breeze blowing through the open window. Useful tip: The train also calls at Phaya Thai station at 06:10 (next to the Phaya Thai BTS Skytrain station) and Makkasan station at 06:20 (Makkasan railway station is not the same as the Airport Rail Link's Makkasan station, make that clear to your taxi driver). 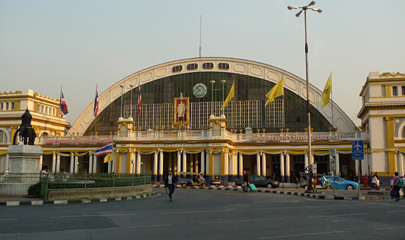 Boarding at these stations can be more convenient if you're staying in northern Bangkok. There's also a 13:05 train from Bangkok arriving Aranyaprathet at 17:35, but this is a bit too late to move on from the border and you may have to spend the night at Poipet. 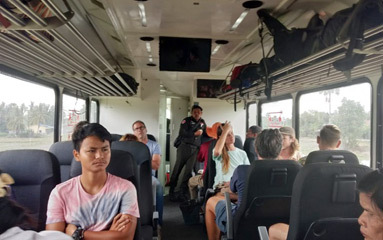 However, one traveller reports that the border is now open until 22:00, making it possible to leave Bangkok on the afternoon train and reach Siem Reap around midnight. 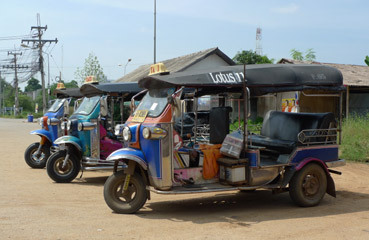 You'll find plenty of tuk-tuks waiting at the station when the train arrives. It's only a 10-minute 6-kilometre (3.8 mile) ride from Aranyaprathet to the Cambodian border at Poipet, and a tuk-tuk will cost 80-100 baht depending on your bargaining skills. If you haven't already bought a Cambodian e-visa (www.evisa.gov.kh), tuk-tuk drivers may try and take you to a travel agency to buy a Cambodian visa at inflated prices. This is no real problem, just say 'No' and insist that they take you direct to the border point and they will do so. They may tell you it's an 'official' visa office, and official-looking people may even ask to 'see' your passport or visa, just ignore them and repeat that you want to be taken to the official border post, and you'll be taken there. The official Cambodian visa office is after Thai exit formalities, between the Thai and Cambodian border posts. So it's really very simple: If you haven't had your passport stamped by a Thai border guard at the Thai border post and passed through the 'Angkor' arch (see the photos of these below), it ain't the official Cambodian visa office! The official visa cost is $30. The border is open 07:00-20:00, and Cambodian visas can be bought there if you haven't bought a Cambodian e-visa beforehand. First get your passport stamped at the Thai side, then walk on for 100 yards under the Angkor - Welcome to Cambodia archway to the Cambodian border post to buy your Cambodian visa, have your fingerprints scanned and your passport stamped. Be careful with your valuables when crossing the border, just in case there are pickpockets around. The whole process should only take around 30 minutes, but at busy times it can take an hour, sometimes more. At the exit from Poipet border post onto the big roundabout, you will see (or be guided to) an official free transit bus to the 'Poipet Tourist Passenger International Terminal' 10 minutes down the road from where all the share taxis and buses leave for Siem Reap or Battambang or Phnom Penh. This shuttle bus (and the man with the official badge who guides you to it) is legitimate. The 152 km (95 miles) should take around 2½ hours by share taxi or 3 hours by bus now that the highway has been improved. Prices are posted at the ticket counter at the Poipet Tourist Passenger International Terminal. A shared taxi costs $12 for a seat or $48 for the whole car. A bus costs $9, minivan $10. 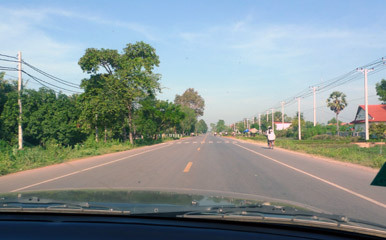 You may also be approached by taxi drivers outside the border post, perhaps $40 for a taxi all the way to Siem Reap. Spend some time in Siem Reap to visit the famous Angkor temples. When you're ready to move on to PP, there are two options, bus or boat. There's a daily speedboat along the river from Siem Reap to Phnom Penh departing 06:30 and arriving 13:00. Distance 251km, fare $35, see below for details. Alternatively, there are buses at various times throughout the day from 06:30 until about 12:30. Journey time 6.5 hours, fare $13-$15, distance 314 km, see below for details. Buses are run by several operators. Some buses are double-deck, some have a WC & refreshments. Step 1, travel from Phnom Penh to Siem Reap by bus (6.5 hours, $13-$15, details below) or more scenically and enjoyably by speedboat (6.5 hours, $35), see below for details. 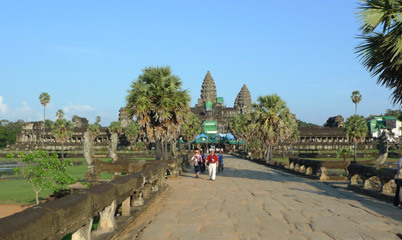 Spend at least 1 night in Siem Reap and maybe visit the Angkor temples. In the morning take a private car, bus or share taxi from Siem Reap to Poiphet on the Thai frontier, it's around 152 km or 95 miles. A private car will cost around $25 for 1 passenger for the whole vehicle, $40 for 2 passengers, and takes around 2 hours 25 minutes so you can normally safely leave just before 09:00. An air-conditioned bus takes around 3 hours with departures from Siem Reap bus station (3 km east of the town centre) at 07:30 and 08:30, fare $9, with free hotel pick up prior to those departure times. 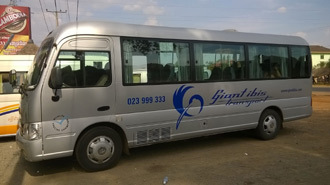 You can buy bus tickets or arrange a private car at any of the many travel agencies around town the day before departure. At busy times of year (for example before and after Thai or Cambodian national holidays), crossing the border can take much longer, sometimes an hour or two, and you may want to leave significantly earlier than suggested here. You'll be dropped at the entrance to the border point at Poipet. Complete the passport stamping and fingerprint scanning at the Cambodian departures office at the border entrance, then walk through the border, past the casinos, under the Cambodian Angkor arch to the Thai border point 100 yards ahead. Fill out a Thai arrivals card and get your passport stamped here and emerge from the border. The whole process should only take around 25 minutes, although at busy times of year it can take an hour or even two. The border is open 07:00-20:00. Now you're in Thailand. Find a tuk-tuk and take it the 6 kilometres (3.8 miles) from Poipet to Aranyaprathet railway station. A tuk-tuk costs 100 baht ($3, £2) although you can bargain for a cheaper price if you're good at haggling. If you need a meal or a beer, there's a simple and cheap Vietnamese restaurant at the road junction at the foot of the station approach, and there's an ATM up the road from the restaurant, simply turn your back towards the station and walk up that road about 300 yards. Two reliable trains a day run from Aranyaprathet to Bangkok, 255 km or 159 miles. You should be able to make the 13:55 departure from Aranyaprathet, arriving Bangkok at 19:55. The other train leaves Aranyaprathet at 06:40, arriving Bangkok at 12:05. 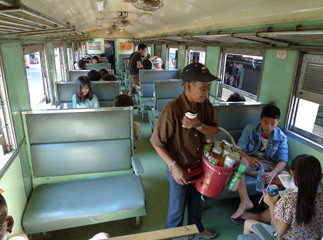 The fare is only 48 baht (£1 or $1.60), no reservation necessary, simply turn up and buy a ticket at the station. Both trains are 3rd class only, but they are clean and it's a really pleasant ride with a breeze blowing in through the open window. The train also drops off at Makkasan (19:40) and Phaya Thai (19:46) before arriving at Bangkok Hualamphong, these can be more convenient stations at which to get off if you're staying in northern Bangkok. The Cambodia Express. It may not officially carry that name, but the morning train to Aranyaprathet takes you to within 6km (3.8 miles) of the Cambodian border. 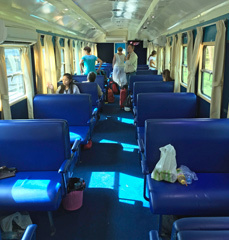 The Bangkok to Aranyaprathet train is 3rd class only, but it's cheap, clean and pretty comfortable with a pleasant breeze blowing through the open windows. Vendors sell food and drink, and there are toilets at the end of each car. Welcome to Cambodia! 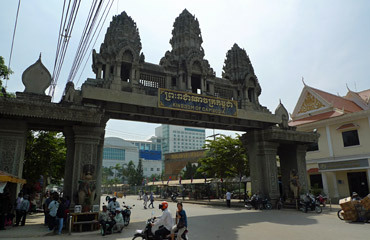 After passing through Thai exit checks, you walk under this 'Welcome to Cambodia' archway to the Cambodia border checks. Traveller Ruth Klaase reports: "I stayed at the great Hua Lamphong hostel, located a very convenient 5-minute walk from the station, handy when you have to get up early. The little shops at the station are open, so don't worry about bringing supplies or even having breakfast, it's available. I was at the station at 5 past 5, which meant no line for a ticket, a relaxed breakfast and plenty of seats to choose from. The train fills up at later stations with people standing in the aisles between some stations, so plan your bathroom breaks carefully. You can buy water from people who come by every half an hour. They also sell food: fishcakes, rice with fried egg, and other stuff. My stomach was fine after the fishcakes. The 6-hour ride (it can take slightly longer) is relatively comfortable. You should definitely bring a pillow or something to rest your head against. The scenery is not spectacular, but the countryside is nice to watch from the window. 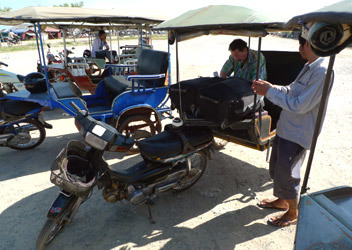 When you arrive at the Aranyaprathet station, tuktuk drivers will immediately offer their service. I walked past some of them, then picked someone who wasn't nagging me, and asked "how much?" He said "80 Baht", which was already less than what I had been told, and other travellers paid a lot more. Also, my tuktuk driver did not try to drop me off in the tout zone, but kindly stopped right around the corner from Thai immigration. If you ask for that straight away I think they will not try to scam you. Thai departure (step 1 of the visa procedure) was a breeze (took 5 minutes). Make sure you get an idea of where the buildings are located (Wikitravel has a handy map, and seat61.com shows pictures of the buildings) so you don't end up in one of the tout zones. Because I did my homework I did not get scammed, and no-one tried either. Other travellers were hassled quite a lot, so know what you need to say: "no thank you, I already have a visa", etc. The guys that give you your Cambodian visa sticker (step 2) are very friendly and helpful, but they did try to get 100 Baht from someone who had already indicated that she had a photo. Bring 30USD for the tourist visa and 100THB extra if you don't have a passport photo for the visa. Then comes step 3: getting your visa sticker stamped. This takes a long time (unless you manage to rush through the other steps ahead of everyone else) because they take everyone's finger prints. Bring water inside as it can get very hot and sticky, and it can easily take 45 minutes before it's your turn. When you come out with your visa, the infamous transportation 'free shuttle bus' nonsense is clearly visible, and many people will try to persuade you to get onto the buses. They don't get too annoying, though, and if you say that you are waiting for someone or are staying in town, they usually leave you alone. Poipet is not an attractive place to hang around in, unless you are a gambler, so why anyone would want to stay there is beyond me. I walked a bit after passing the roundabout (as is recommended) to avoid taking a cartel-owned taxi, but ironically still ended up in one. It was $10 each for me and two others, so in terms of price it doesn't make a big difference, but it's still annoying. They try to drop you off at the 'bus station', but don't fall for this. They were very persistent, telling us that cars can't go into Siem Reap (they can), they didn't know the hotel, etc., but we simply said we wouldn't pay until we were at our hotel. Then it suddenly wasn't a problem and we were dropped off at our hotels. So remember: they don't get aggressive, and when you know what you're doing you won't get ripped off, but it's worth planning this trip carefully to avoid getting ripped off. It's an interesting adventure, but a shame that this is one's first impression of a beautiful and friendly country." Traveller Cynthia O'Brien travelled from Bangkok to Siem Reap: "Travelling from Bangkok to Siem Reap this way was much easier than I expected, after reading many older stories about this route. I took the 05:55 train from Bangkok to Aranyaprathet, for 48 baht. From the station at Aranyaprathet, I took a tuk-tuk for 60 baht to the border at Poiphet. However, the driver made a detour to a travel agency, which is one of the visa scam places. I already had an e-visa, which I would recommend to avoid the hassle at the border. The salesman at the travel agency wanted me to go into his office to talk to him and asked to see my passport. I refused to hand him my passport and the tuk-tuk driver drove me away quickly when I told other travellers not to get their visa at that place, but to get it from Cambodian immigration at the border, where it will cost less. 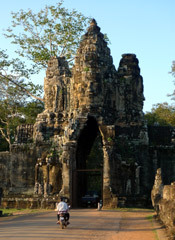 The biggest change from the older accounts is transportation to Siem Reap from the border. As soon as you cross into Cambodia, there is a stop for a free shuttle bus. Do not hesitate to take this free bus to their nearby travel centre. 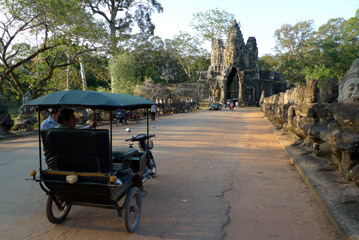 It is operated by a company that arranges legitimate, hassle free transportation to Siem Reap. The two best choices are a mini-van for $10 per passenger, which leaves as soon as it has nine passengers, or a share taxi for $12 per passenger, which leaves when it has four passengers. The prices are non-negotiable, and you buy your ticket for either option at a ticket window, rather than haggling with a driver. The third option is a public bus that leaves at 2:30pm, for $9. However, I do not know how long the journey takes by bus. Since I was travelling alone, I took the mini-van, which only took about an hour to get nine passengers. The highway is now complete, so the ride only took 2 hours and 20 minutes, which included a 30 minute break at a restaurant. When we arrived in Siem Reap, they brought us to a guest house and asked us if we wanted to look, but there was no pressure. There was nothing wrong with the guest house and it was in a good location, but I already paid for another. Included in the ticket price was a tuk tuk ride to your guesthouse. And if you do not have a guest house, the driver will take you around until you find one that you like." Traveller Andreas Klein also travelled this way: "We caught the 05:55 train from Bangkok to Aranyaprathet. Tickets are still 48 Baht and are easy to book. I'd recommend getting to the station at around 5 o'clock to get this done. Although only 3rd class is available, the train is really good. 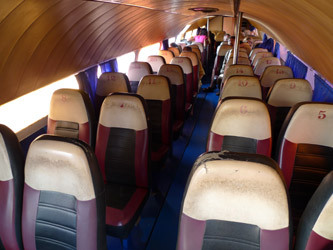 It was reasonably clean, the seats are comfortable and there are small fans for every compartment. Additionally, you can open the windows which gives you a nice breath of air. The train ride was very interesting due to the landscape and cities you travel through and the (very friendly) people you meet in the train. Every now and then people come to sell food and drinks. We found it also possible to get some hours of sleep in the train. The way to the border is exactly as you describe on your website: We took a tuk-tuk. I can only recommend getting an e-visa. It was very helpful to avoid getting in contact with all the scams offering other types of visa shortly before you cross the border. The signs to the visa entry point are not the best and hence you might fall for one of the help offers from the scams. 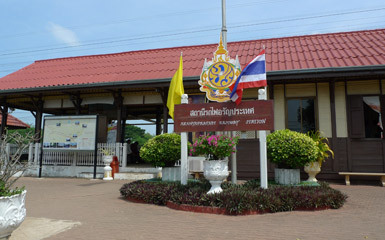 To cross the border, just walk along the main road through the entry gate and you will find the visa-checkpoint right at the end on the right side. The entry-process is very easy. 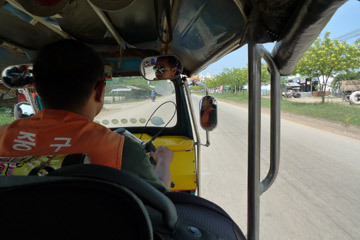 Finding a reasonable transportation to Siem Reap cost us about 1.5 hours in the sun and lots of negotiation. Some scammers claimed to be from a governmental organisation and tried to sell far too expensive transportation (US$60 to Siem Reap). Avoid getting caught by them and their "official / governmental" bus and organisation (they all wear nice shirts with a Cambodia emblem, but we are still not sure whether this is real), which will only bring you to their taxi stand. Like you say on your website, reasonable transport by taxi to Siem Reap should be $25, which we managed to achieve by walking along the main road, followed by several taxi drivers, who reduced their fares steadily the closer we came to the bus station. It is about 140km." Further feedback from travellers who have used this route between Bangkok and Phnom Penh or Siem Reap would be appreciated, as information is difficult to come by. There is no railway (at least, not yet) between Saigon & Phnom Penh. However, a number of bus companies each operate a range of daily air-conditioned buses in each direction, taking about 6½ hours (they usually quote 5-6 hours, but assuming 6.5 hours is more realistic). There's no point in flying for such a short trip, as flights on this route are expensive, and they save little time. Flying will take up to 4 hours once travel to and from airports, check-in & baggage reclaim are included. The bus costs less than a tenth of the flight price, and is an insight into Vietnam & Cambodia in a way a globalised flight just isn't. Saigon to Phnom Penh is 240km, 150 miles. Use these times as a rough guide as you're often quoted different times in different places! Just 3 operators are shown here, but there are several others. You can check times for multiple operators (including all three shown above) at www.camboticket.com. 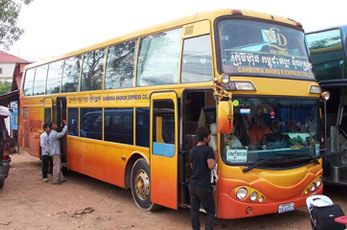 The buses operate via Moc Bai (Vietnamese border point) and Bavet (Cambodian border point). Cambodian visas can be bought at the border or you can buy an e-visa in advance at www.evisa.gov.kh. In Saigon, Kumho Samco, Mekong Express Limousine & Mai Linh buses leave from the bus station at 237 Pham Ngu Lao Street, Ben Nghe Ward, 1Dist, HCMC. In Phnom Penh, there is no centralised bus station. Mekong Express Limousine leaves from a terminal just out of town, a minibus transfer can be provided from most hotels (it's reported that they no longer have their office at 87 Sisowath Quay at the corner of Street 102 on the riverfront). MaiLinh buses leave from the Olympic stadium. However, some of these bus companies offer a free transfer from your hotel, just ask. 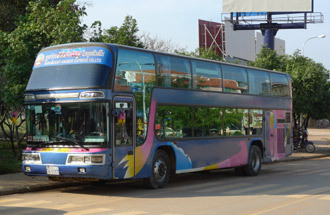 Reliable companies operating modern direct buses between Saigon & Phnom Penh include (1) Mekong Express Limousine Bus (catmekongexpress.com), (2) Sapaco Tourist, (3) Kumho Samco, and (4) Mai Linh. This Tripadvisor link is useful in giving the low-down on each bus company. It's best to avoid the 'budget' operators such as Narin or King who charge $4-$6, use older buses and make you switch buses at the border, taking 7½ hours. You can buy tickets online (and compare prices & times) for multiple operators at either 12go.asia, www.baolau.com or www.camboticket.com. All these agencies are reliable and offer print-your-own online tickets. Alternatively, you can buy a ticket when you're there, simply by walking into any local travel agency when you get to Phnom Penh or Saigon and asking for a bus ticket. Or ask at your hotel or guest house to arrange a ticket for you. In Saigon you can also try buying tickets from the Sinh Cafe, www.sinhcafe.com. In Phnom Penh, try www.asiavipa.com. There are so many companies and buses, you'll always find a bus with tickets available, even booking the day before you travel. Email addresses for the operators either don't exist or typically don't work. The Mekong Express bus from Saigon typically starts boarding around 20 minutes before departure, across the road from the Mekong Express office on Pham Ngu Lao in central Saigon. Baggage is tagged and loaded under the bus and you're given a luggage receipt. The bus is air-conditioned and there's a clean toilet at the rear. The bus normally leaves promptly, refreshment towels are handed out and then mineral water and a snack. The bus staff collect passports, along with $30 if you haven't got a Cambodian visa. 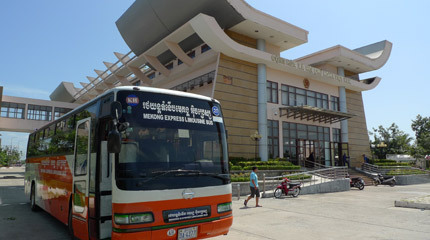 The bus reaches the Vietnamese border at Moc Bai in around 1 hour 55 minutes. Here, everyone leaves the bus, enters the terminal and files towards the passport check where the collected passports are already being stamped. Names are called out, you collect your passport when called, and you leave the building at the far door and rejoin the bus, which by now has pulled forward. When everyone is back on board, the bus drives on 200 yards to the Cambodian border post at Bavet. Everyone gets off the bus again and enters the building. If you've an e-visa you'll be shown to the e-visa desk to have it checked, then you get fingerprint scanned and passport stamped at the passport desks. The bus leaves when everyone is back on board, around 2 hours 55 minutes into the journey, driving on for 5 minutes past the casinos to a lunch stop at a simple cheap restaurant for around 40 minutes. US dollars, riel and Vietnamese dong are accepted here, and neither the food nor the beer is expensive. Once in Cambodia the landscape changes significantly, from urban ribbon development which has stretched almost all the way from Saigon to the border, to far more rural scenes with rice fields and water buffalo. The architecture also changes, from the Chinese-inspired buildings in Vietnam to temples and shrines more akin to those in Thailand. The bus used to cross the Mekong on ferry at Neak Loeung, but now uses a modern bridge. Expect an arrival in Phnom Penh around 6 hours 30 minutes from Saigon. You may find free WiFi available once the bus enters Cambodia. Don't be surprised if the bus drops you somewhere in your arrival city other than where their website shows the arrival office. This happens regularly! 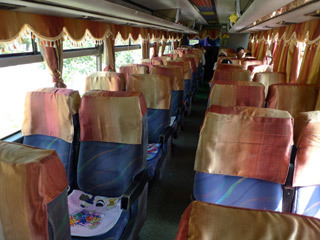 Seating on the Mekong Express bus. Mineral water & snacks were handed out. Toilet at the back. Traveller Jon Feltham took the bus from Saigon to Phnom Penh: "The bus trip from Saigon to PP (about 6 hours ) was with Kumho Samco Buslines. We bought our tickets from a travel agent close to our hotel, but the bus company's offices in Ho Chi Minh city are at 237 Pham Ngu Lao Street, District 1, HCMC. We took a taxi from our hotel to their booking office/travel agent/pick up point, where the coach picked us up. They took our passports and filled the immigration form in to allow us to enter Cambodia, which was a pretty nice touch I thought and saved us routing about for pens and stuff. After the border control formalities, the driver stopped for a spot of lunch 30-45 mins. Then on to PP which included a river crossing by ferry which came as a surprise to us [the ferry has now been replaced by a modern bridge]. The bus company runs a daily service from, Ho Chi Minh City to PP at 07:30 10:30 and 15:00. Ticket prices are $10 US. The busses are pretty modern with air con and have a conductor who rounds everyone up when the bus is ready to move on." Traveller Kevin Nathan took the bus from Phnom Penh to Saigon: "I bought a ticket from Capital tours below the Capital Guest House, inside the restaurant. The fare from PP to HCMC was US$ 9 for an air conditioned bus. I took a bus which left PP at 06:45 and arrived in HCMC at 13.30. It was a good bus with good service, especially when crossing the immigration. They gave free water, wet face tissue & face mask. We also stopped for lunch before the border. The bus arrived at De Tham Street (a backpacker area) in HCMC." 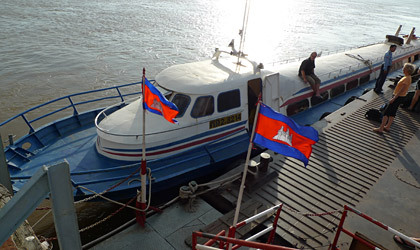 Alternatively, a number of local tour operators run a river boat + bus service from Saigon to Phnom Penh, a very enjoyable way to travel between the two cities. Try www.bigpond.com.kh/users/capitol/opentour.htm. 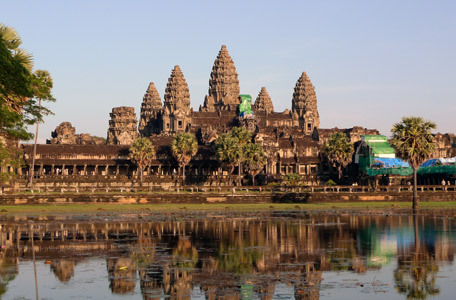 There are two ways to travel between Phnom Penh and Siem Reap, for the temples at Angkor. Option 1, by speedboat along the river. $35, easily the most fun though sometimes cancelled due to water levels, not much slower than the bus. Option 2, by bus. $13-$15, cheapest, most frequent, slightly faster than the boat. The Phnom Penh to Siem Reap speedboat costs more than the bus, takes a bit longer (but not much) and can be cancelled if water levels are too low (for example, between March & August) or if there aren't enough tourists to support it. But seeing rural life on the river from the sun-drenched deck of a speeding riverboat is amazing, it can be one of the highlights of visiting Cambodia, highly recommended. On the other hand, if you have mobility problems, so would need to stay in your seat inside the boat for the whole trip, you may prefer the bus, the photos and video below will help make your decision. The boat journey is approximately 251 kilometres (157 miles). 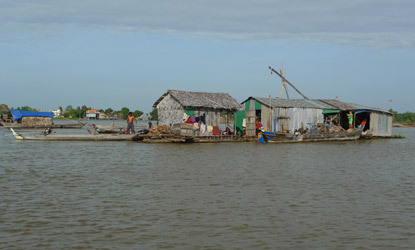 In Phnom Penh, the speedboat leaves from the river boat dock at the northern end of Sisowath Quay, in central Phnom Penh. In Siem Reap, the ferry arrives/departs from the boat dock at the Chong Kneas floating village, some 11 km (6.8 miles) south of Siem Reap itself. Transfer from Chong Kneas to central Siem Reap: When you arrive to catch the boat at Phnom Penh boat dock, you'll be asked if you want a tuk-tuk into Siem Reap, for $1 per person. Your name will be taken. On arrival at the Chong Kneas boat dock, a tuk tuk driver will be holding a card with your name on, and will take you into central Siem Reap in about 15-20 minutes. Traveller Lenny Hartley travelled from Phnom Penh to Siem Reap by river boat: "Most hotels and travel agents in Phnom Penh will book you a ticket which includes pickup by Tuk Tuk driver to the embarkation port just a short distance away from the main tourist riverside area of Phnom Penh. Stalls at the embarkation point will sell you food and water although possibly better quality can be purchased elsewhere! The boat itself is more like a river bus and travels at approx 45kph (according to a sat nav I saw), best to get their early and get a seat on the bow so you can dangle your legs over the side whilst using the rail to keep you safe. The roof is curved and although there is a small rail its easy for your baggage to roll over the side and into the water never to be seen again if you encounter waves or swell in the Tonie Sap. The passageway on the deck between the seating area and the roof is about 18 inches wide with no handrails for the first couple of metres so to begin with its a bit scary moving about between seating and roof but after a while you get used to it. Its a great way to see the countryside and riverside so the six hours or so pass far faster than a bus or plane journey. The landing area at Siem Reap is some distance from town, and you will be swamped by people trying to carry your bags up the steep gangways or to take a tut tut into town, best to get your hotel to organise a Tut Tut, if your lucky and get a good driver try and hold onto him for the duration of your visit." 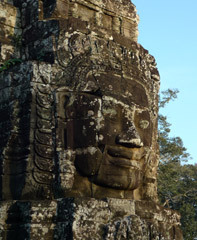 Traveller Geoff Holman travelled PP to Siem Reap: "I booked this trip the day before at Capital No.1 Guesthouse in PP. Picked up by a minivan from guesthouse at 06.30 and transported to wharf. Boat was about 75% full. Weather was OK for travelling on the roof, bit hard on the back after a while. Most of the backpackers/international travellers were up top to take in the views. Take refreshment as none available. Air conditioning in cabin was a little cool, but all in all a comfortable and pleasant trip. Chaos at the landing at Siem Reap. Host of small boys trying to grab your luggage for a fee. Local police on hand but made no attempt to intervene. 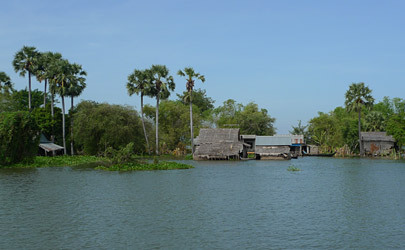 Apparently the journey can be less enjoyable in the dry season as the lake is quite shallow and groundings are common." Traveller Justin Kilby reports: "The fast boat from Phnom Penh to Siem Reap is fairly comfortable and quite an interesting journey up the Tonle Sap river and across Tonle Sap Lake, but make sure you take food and water as there is none available on the boat. Also make sure you buy your ticket from a reputable source, for example your hotel or legitimate travel agent as there are reports of travellers buying tickets for non existent boats." Option 2, Phnom Penh to Siem Reap by bus. Giant Ibis, www.giantibis.com. Mekong Express, catmekongexpress.com. PSD Express, www.psdxpress.com. Shaded = sleeper buses with almost-flat bunks. A third company also operates on this route, Angkor Paramount Express. Feedback from booking & taking these buses appreciated! The road distance is approximately 314 kilometres (196 miles). Phnom Penh has no centralised bus station. Mekong Express leaves from a terminal just out of town with a free minibus transfer from most hotels. Bus companies often offer a free transfer from your hotel. 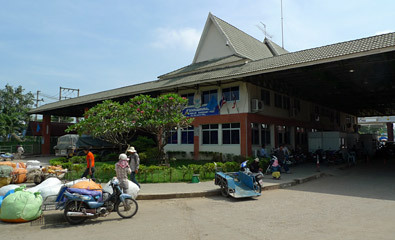 Siem Reap bus station is 3 km east of town. Bus companies may offer a free transfer from your hotel. Mekong Express can be booked online at reliable agency www.baolau.com which accepts international credit cards & issues e-tickets. PSD Express can be booked online at reliable agency 12go.asia which accepts international credit cards & issues e-tickets. Giant Ibis can be booked online at reliable agencies 12go.asia or www.baolau.com. Both accept international credit cards & issue e-tickets. Or you can ask at your hotel or go to any local travel agency. A double-decker bus from Siem Reap to Phnom Penh. Courtesy of Michelle Moret van der Spek. 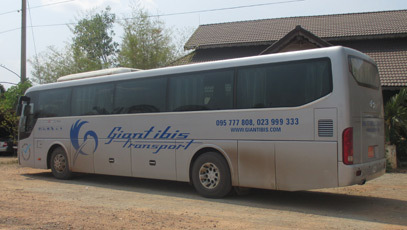 Giant Ibis bus from Phnom Penh to Siem Reap... Courtesy of Maureen Spencer. In Phnom Penh, there is no centralised bus station. Mekong Express Limousine leaves from a terminal just out of town, with a free minibus transfer from most hotels (it seems they have moved from their office at 87 Sisowath Quay at the corner of Street 102 on the riverfront). Bus companies often offer a free transfer from your hotel. For train service Phnom Penh - Battambang, see above. Ask at your hotel or go to any local travel agency. 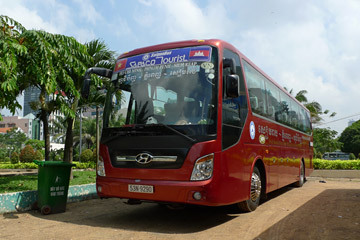 Alternatively, try Cambodian bus ticket reseller website www.camboticket.com. They sell tickets easily for a variety of bus operators with payment by international credit card and for some departures from Phnom Penh, cash on delivery. Feedback if you use them would be appreciated. Giant Ibis minibus from Phnom Penh to Sihanoukville... Courtesy of Maureen Spencer. PSD Express also run air-con buses at 08:30 & 14:30. PSD Express also run air-con buses at 08:30 & 15:30. In Phnom Penh, there is no centralised bus station. Mekong Express leaves from a terminal just out of town with a free minibus transfer from most hotels. Bus companies often offer a free transfer from your hotel. The road distance is approximately 220 kilometres (137 miles). Also see the new train service above. In Phnom Penh, there is no centralised bus station. Bus companies often offer a free transfer from your hotel. To buy tickets, ask at your hotel or go to any local travel agency. Alternatively, try new Cambodian bus ticket reseller website www.camboticket.com. They sell tickets easily for a variety of bus operators with payment by international credit card and for some departures from Phnom Penh, cash on delivery. Feedback if you use them would be appreciated. 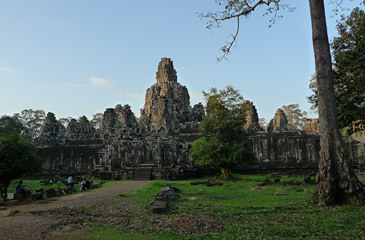 Cambodia's premier tourist attraction is the temple complex at Angkor, north of Siem Reap. 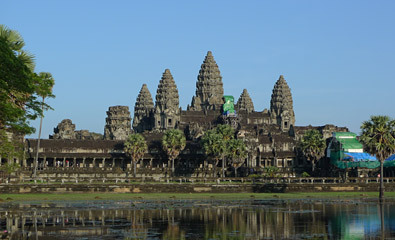 Angkor Wat is the biggest and best-known temple, though there are many others. You really need a whole day to see the main ones, and several days to do the whole complex justice. The temples at Angkor are around 3km (2 miles) north of Siem Reap, you can hire a tuk-tuk or bicycles to take you there are around. You need to stop on the way at the ticket office. A one-day ticket for the whole Angkor temple complex costs $37 as from 2017. To visit Angkor Wat, make sure you wear 'respectful' clothing, meaning your shoulders are covered with a top with sleeves, and no shorts. And past the gatehouse, a long raised walkway leads to the temple itself. If you have the time, meaning 2-3 weeks in total, you can reach Cambodia overland all the way from London. You'd take Eurostar and a sleeper train to Moscow (2 nights), one of the two weekly Moscow-Beijing Trans-Siberian expresses (6 nights), the twice-weekly Beijing to Hanoi sleeper train (2 nights) and a Vietnamese domestic sleeper train to Saigon (2 nights), and finally a bus from Saigon to Phnom Penh. See the London-Russia page for London-Moscow, the Trans-Siberian page for Moscow-Beijing, the Vietnam page for Beijing-Hanoi and Hanoi-Saigon, and see above for details of the bus service between Saigon and Phnom Penh. To get the most out of a trip to SE Asia, you'll need a good guidebook - and I have always thought that the Lonely Planet or Rough Guides are the best ones out there. This is a celebrated bar facing the river on Sisowath Quay, well known on the ex-pats circuit. But it's also a small hotel with nine rooms on the 1st floor, including a deluxe room at the front on the corner facing the river, and others at the back. It's a vibrant and well-located place to stay, maybe a bit noisy until they turn off the music around 10pm. With an excellent restaurant (try their Fish Ashok, a traditional Cambodian fish curry) and a great breakfast included in the room rate, this is a wonderful place to stay. 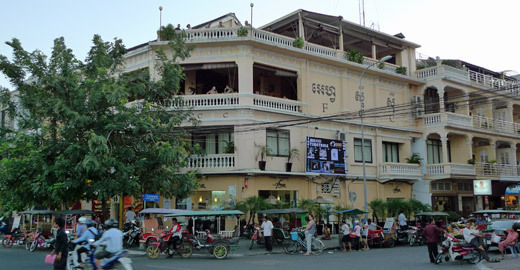 The Foreign Correspondents Club (FCC), Phnom Penh, right on the river front. Breakfast on the 2nd floor terrace.